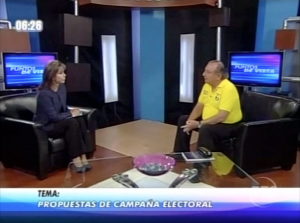 In an interview with journalist Luisa Delgadillo from channel RTS, the PRIAN List 7 candidate for President of the Republic, Álvaro Noboa stated that the “Álvaro Noboa Plan” would attract a thousand new and big companies that would generate employment, raise people’s income levels, and reduce crime. He repeated that his plan include those industries offering their employees training, as is done in all modern industry, and in that way they become specialized employees whose basic salaries rise to $1,000. From there, if they go on, they go to a technical school or a university and they specialize, and they go on to earn $2,000 and even $3,000 dollars. And at that moment, they become part of the middle class with the capacity of acquiring a house, a car and better education for their children. All of that will be accompanied by judicial guarantees, without anyone putting their hands on the Courts, without class warfare, where everyone is working together – State, businessman, and workers – to generate wealth, he indicated. To lower the high cost of living, he declared, the high tariffs on imports need to be eliminated; free trade agreements need to be made to reduce the price of imported goods, the tax on currency sent abroad needed to be eliminated; the non-refundable advance payment of 2% tax on income, and Value Added Tax (VAT) needed to be lowered. At the end of the interview, the List 7 Presidential candidate stated that under his government, he would assign special quotas to the municipalities in order to fight against the impoverished neighborhoods where there are no paved streets, where there is no water, where there are no sewer systems, where there is no electricity, and they living conditions are in a sub-human state. He repeated the denunciation that he had made before representatives of the OAS for the political persecution of which he had been a victim, and for the electoral inequalities there is in regards to the time and space given in the communications media to Economist Correa and that given to the rest of the candidates. Luisa Delgadillo: Today in Punto de Vista: Attorney Álvaro Noboa, Presidential candidate for the National Institutional Renovation Action Party, the PRIAN, and whom we thank and give the most cordial welcome. Thank you, Counselor, for joining us. Welcome. Álvaro Noboa: Thank you very much. I thank the channel and the television viewing public who are listening to us at this moment. Luisa Delgadillo: What they want to hear: proposals, Attorney Noboa. What are the platforms of your campaign, and those that you hope to realize upon becoming President of the Republic? Álvaro Noboa: At the moment, the three biggest problems the country is facing are unemployment, crime and the high cost of living. 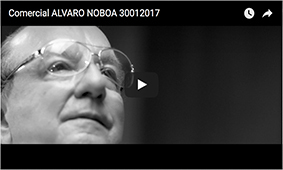 In regards to unemployment, I have a plan, called the Álvaro Noboa Plan, that not only covers the issue of unemployment but many areas, and there, what I want to do is attract a thousand national and foreign investors so that they invest in the country, all of them with modern technology. That those investments be throughout Ecuador and in all areas, in tourism, in industry, in agriculture, in technology. Luisa Delgadillo: How should that foreign investment be attracted, Counselor Noboa? Álvaro Noboa: That those industries offer their employees training, as is done in all modern industries. Upon giving them training, they become specialized employees whose basic salaries rise to $1,000. From there, if they go on, they go to a technical school or a university and they specialize, and they go on to earn $2,000 and even $3,000 dollars. And at that moment, they become part of the middle class with the capacity of acquiring a house, a car and better education for their children. Luisa Delgadillo: Something that is essential. You have touched on a basic issue and you aspire to all Ecuadorians having honorable employment for an honorable life and you say that you are going to do it by bringing around a thousand investors. How will they be attracted, or how do you transform Ecuador into this attraction for foreign investors, Counselor? Álvaro Noboa: Lowering taxes on income lowering taxes on income to 10%, but as there’s going to be a thousand companies paying 10%, the Treasury is going to be full because 10 x 1000 = 10,000. On this very day, there are 40 mid-sized companies paying 23% that doesn’t even reach 1,000. That is to say, in the current economy, private business has 40 companies that don’t even reach paying 1,000, while in the new economy which I propose, there will be one payment of 10,000. Luisa Delgadillo: Incentives in any case for those investors. You have touched on another point. You want and you are attempting to put an end to crime that has reached great heights and has many residents of the country on edge. Álvaro Noboa: Also the investors are going to require judicial guarantees. The government can not interfere with the Courts. Those investors will also need for the class warfare in Ecuador, which has been fueled by the government, to end. They should propose that the State, the businessman, and the workers cooperate in order to generate wealth. With regard to crime and the high cost of living: the high cost of living is a product of the amount of taxes there are, today, in the country. Because of the lack of free trade agreements, there are huge tariffs as well on imported products. A refrigerator of $200 has a very high tariff. Luisa Delgadillo: Which means the prices shoot up. Álvaro Noboa: Exactly. And to this add the taxes for currency going abroad of 5%, and to that add the 25% non-refundable income tax, if the company loses, they don’t return the 2%, to this add the IVA and you have a refrigerator that costs $400 or $600. Whereas in Colombia or Peru, which have free trade agreements with the United States, the refrigerator costs $200. Luisa Delgadillo: How can that reality be changed? Álvaro Noboa: Signing free trade agreements and eliminating all those taxes that, in the long run, are paid by the poor. Luisa Delgadillo: Citizen Security. You said that you also had a plan to end or slow down crime. Álvaro Noboa: When there are no jobs and a man who has a child crying because he hasn’t got anything to eat, he’s got a sick wife, unfortunately, he has to go out and steal. When there are jobs, that disappears, and that’s how it happened in Japan, in Norway, in Sweden, where there is 100% employment or 98% employment. In many of those countries, there is no crime. Luisa Delgadillo: Is it possible to achieve that in Ecuador, Counselor Noboa? Álvaro Noboa: It’s possible, when Ecuadorians decide to leave the old political scheme behind. Because the blame for everything that happens in Ecuador is not the businessman’s. The blame belongs to the politicians of always, who have governed this country for a hundred years and have not been able to get this country out of poverty. Economist Correa, I agree with him, he has done well with the Voucher because if a poor person is dying of hunger, he has to be given $50. But he is increasing the poverty. Before there were a million Ecuadorians receiving the $50 Voucher. Now there are two million. That means that there are two million unemployed. Therefore poverty is increasing in Ecuador. Apart from that, he has done well with the health plan, and with social security. I will continue with the Voucher but with the Noboa Plan that will develop a new economy in which the people will be of the middle class, and I will also give special quotas to the municipalities in order to resolve the impoverished neighborhoods where there is no asphalt, where there is no water, where there are no sewers, where there is no electricity, and they live in a subhuman state. Luisa Delgadillo: We have less than a minute left. What would you say to those people who are listening this morning and who you will surely visit in your tour of the country? Álvaro Noboa: I would like to tell the country, as well, that I have submitted a denunciation before the representatives of the OAS with regard to the political persecution of which I have been a victim and for the electoral inequality there is with regard to the time and the space given to Economist Correa in the media and that given to the rest of the candidates. Luisa Delgadillo: Do you believe that you can get a response from that denunciation? If the panorama is such as it is? What will be the results of the next electoral process? Álvaro Noboa: That is already out of my control. It depends on bodies like the OAS. Luisa Delgadillo: Fine, I thank you very much for being here in the morning, Counselor. Thank you, and have a good morning.